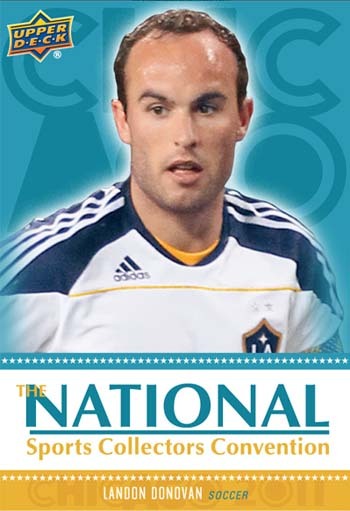 Carlsbad, CA (July 19, 2011)– The Upper Deck Company is once again thrilled to have a strong presence at the 32nd Annual National Sports Collectors Convention at the Donald E. Stevens Convention Center in Rosemont, Illinois from August 3-7, 2011. Upper Deck will have plenty of on-site promotions taking place at the company’s corporate booth (# 634) to excite the tens of thousands of collectors in attendance. For instance, on Wednesday, August 3, during the VIP “Sneak Peek” Day, a special six-card, VIP-emblazoned cello-wrapped set from Upper Deck will be available to all show attendees who show their VIP passes to The National. The player lineup for this coveted takeaway includes Michael Jordan, Wayne Gretzky, Sidney Crosby, LeBron James, Bobby Orr and Landon Donovan. During each public day of the show – Thursday through Sunday – Upper Deck will be conducting its popular foil pack wrapper redemption program starting at 12 noon. 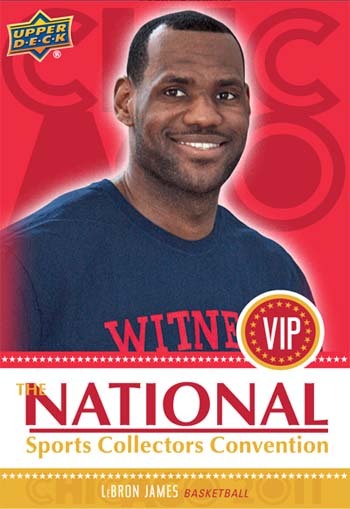 Fans who purchase five packs of specified Upper Deck card packs from Certified Diamond Dealers at the show will receive a voucher they can bring to the Upper Deck booth to receive one of four different 2011 National event-exclusive, five-card packs. Each day there will be a different five-card collection redeemed and they will be available while supplies last. A full list of the acceptable products will be displayed at the Upper Deck booth with information on which retailers at the show will be selling them. Another special promotion occurring at the show involves Upper Deck’s new North Carolina Basketball product. Fans who purchase a hobby box of Upper Deck’s UNC Basketball product from a Certified Diamond Dealer will receive a special raffle ticket which they can bring to the Upper Deck booth. On Saturday, August 6 at 5 p.m., Upper Deck will take all the entries and raffle off a variety of prizes including a Michael Jordan autographed Upper Deck Authenticated (UDA) No. 23 UNC jersey. UDA will have plenty going on during the week, starting off with two daily giveaways taking place at 11 a.m. and 3 p.m. where two fans will have the opportunity to assemble large Curve™ displays in order to win a special prize. UDA will also be showing off and selling a variety of exciting new collectibles from the industry leader in authentic collectibles. One of the unique pieces UDA will be selling is its new “Signature Safe” product which is great at a show like The National because it allows fans to easily carry around 8” x 10” photos they wish to have signed in the autograph pavilion. And last but certainly not least, Upper Deck will have on display at its booth a variety of unique cards for collectors to review. On display will be a full set of the 2011 Goodwin Champions “Animal Kingdom” patch cards; 2011 Goodwin Champions Entomology cards; Evolution video cards from the 2011 Upper Deck Football set; and some special displays with cards from the personal collections of some of Upper Deck’s Diamond Club members. "We are pulling out all the stops to make Upper Deck’s presence at the 32nd National Sports Collectors Convention a memorable one for our fans in attendance,” said Mike Phillips, Upper Deck’s director of Hobby Sales. “By creating promotions that help support the efforts of our Certified Diamond Dealers, we can help create a situation where fans are seeing real value in purchasing through the right channels. Being able to provide so many unique giveaways and promotions during this show is also a great way to give back to our fans who have always been very engaged with our brand and products. We can’t wait to get out there and have the chance to interact more with them!"